On Monday, April 1, the first day of Earth Month—or April Fool’s, depending on the way your mind runs—Clif and I went to the Gardiner Co-op to buy some bulk items. Gardiner is about fifteen miles from where we live, and nowadays, we always enjoy going to this up-and-coming city that was once in the doldrums with too many empty storefronts and a shabby main street. But Gardiner did something that other communities would do well to emulate: It decided to invest in itself by giving grants and tax breaks to small, local businesses. 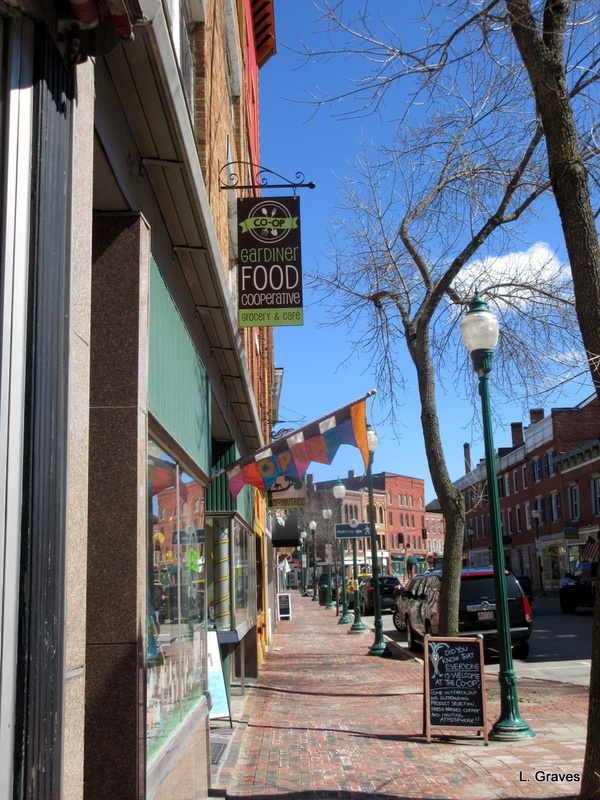 Now the main street is a lively place with restaurants, a donut shop, art studios, and the Gardiner Co-op. 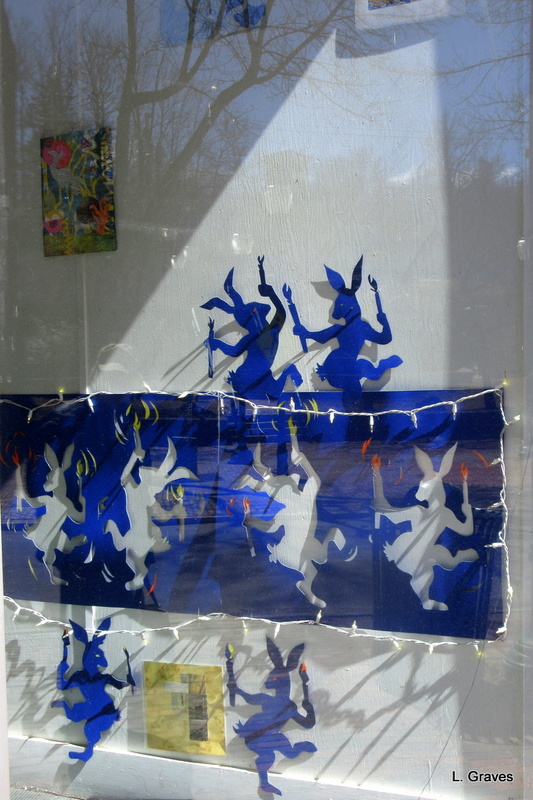 Gardiner is a small city to enjoy, with different festivals to celebrate each season. Because we went on Monday, the main street was quiet, and we were able to get a parking spot not far from the Co-op. On our way, we passed this snappy exhibit at Art Dogs Studios, an arts collective. Then it was on to the Gardiner Co-op. This shot shows what a lovely old city Gardiner is. At the Gardiner Co-op, here is the cheery, welcoming sign that greets customers. That is one lively carrot! There are many things to like about the Gardiner Co-op, but for me, one of the best things is that the store actually smells like food. This might sound silly, but cast your mind back to the various grocery stores where you shop. How many of them actually smell like food? Mostly, they have a generic store smell, and if you closed your eyes, you might not even realize there was food in the store. While the Gardiner Co-op is small, it is cozy rather than cluttered, and the store is filled with good things to eat—fresh fruit and vegetables, some canned goods, and a fair number of bulk items, including coffee and peanut butter. Naturally, we brought our own containers, and they where cheerfully weighed by the woman running the store. She praised us for bringing in our own containers. “Wonderful!” the woman said. “Because of this, there will be less plastic going into our landfills.” She smiled at me, and I felt as proud as kindergartner getting a gold star for good behavior. The Co-op also has a cafe—no doubt this is where some of the good smells are coming from—and next time we go, we will have a cup of soup before we shop. Here is what we got at the Gardiner Co-op: chickpeas, black beans, nutritional yeast, onion powder, and garlic powder. Note the perky Renys bag by the jars of food and spices. 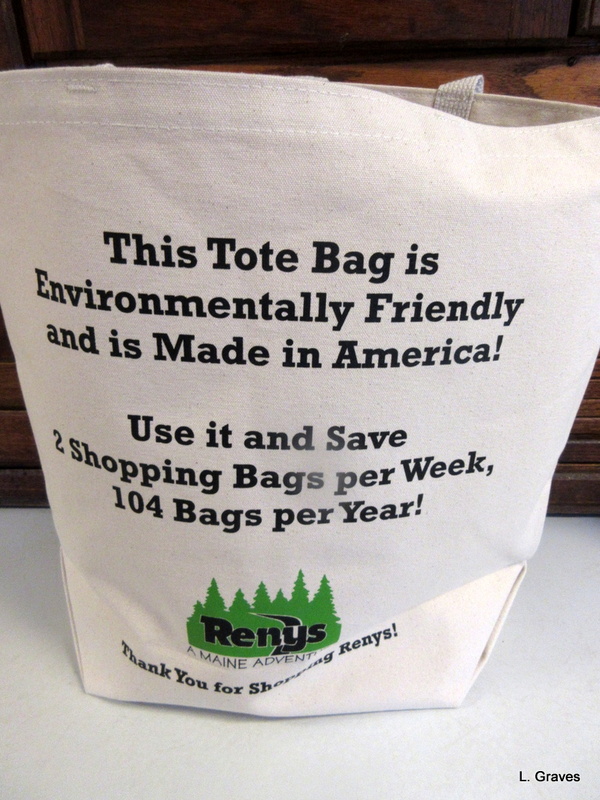 Renys, an old-timey Department Store, is also in Gardiner, and I bought the bag in honor of Earth Month. 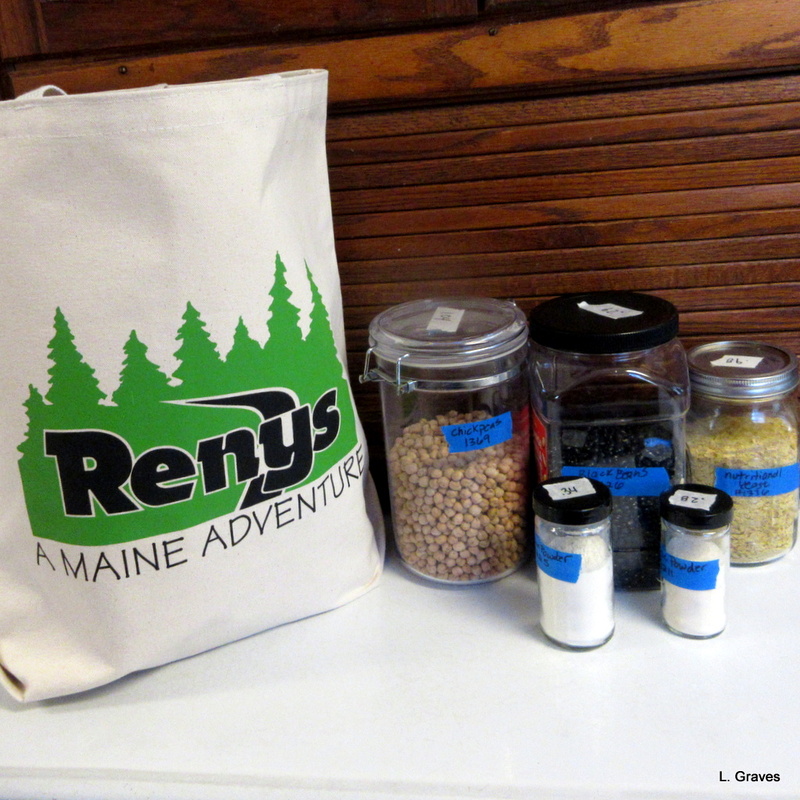 This canvas bag is sturdy, roomy, and made in the US, and it will be a wonderful addition to the bags I keep in the car. Here is a view of the back side. Shameless advertising, I know, but what the heck. As the old saying goes, if it’s true, it ain’t bragging. Nice! Where is the lake and town in your header picture? That is the Kennebec River look toward Hallowell. I love shopping bulk, esp. spices and herbs, which are often organic and fresher, and MUCH cheaper than the mainstream grocery McCormick brand. What a difference! We went once to this co-op! Time to take another trip there, maybe after a breakfast at A-1 Diner! Gardiner is becoming a bustling little city. I love reading stories about revitalized communities! Thanks for sharing your experience, Laurie. It looks like you visited on a crisp, clear day. You’re welcome. it was indeed a crisp, clear day. It’s a charming shop chock full of healthy, delicious food. Sounds like a great place to visit. I know what you mean about the smell of food shops. I love going to Commonsense Organics here in Wellington, that smells of herbs, spices, fruits and vegetables. A wonderful smell. Also, Commonsense Organics is a great name. Our supermarkets sometimes smell like food but they pipe the smell in. What a great idea to support local businesses through grants and tax breaks…win/win for everyone. I love stores that smell of all the foods and produce….and it always reminds me of the 70’s when these stores were all over Australia. A shining example of what can happen when government works the way it should. this did my heart good! Yay! for your smart and caring habits! Thank you for doing your part and inspiring us! A-w-w-w, thanks for the kind words. That town has good leadership, to make such a transformation! It’s amazing how many stores that sell food don’t smell like food at all. Gardiner got it right – This sounds like a good example of government doing the right thing and helping small businesses revitalize this town. AND they helped the environment by bringing such a cool shop into town. Great story. AND such a cute town! If you and your mom come to Maine, put Gardiner on your list of places to visit. This reminds me of a food coop I used to shop at in Wisconsin. The food tends to smell like food at the Greek and Indian grocery stores near us. 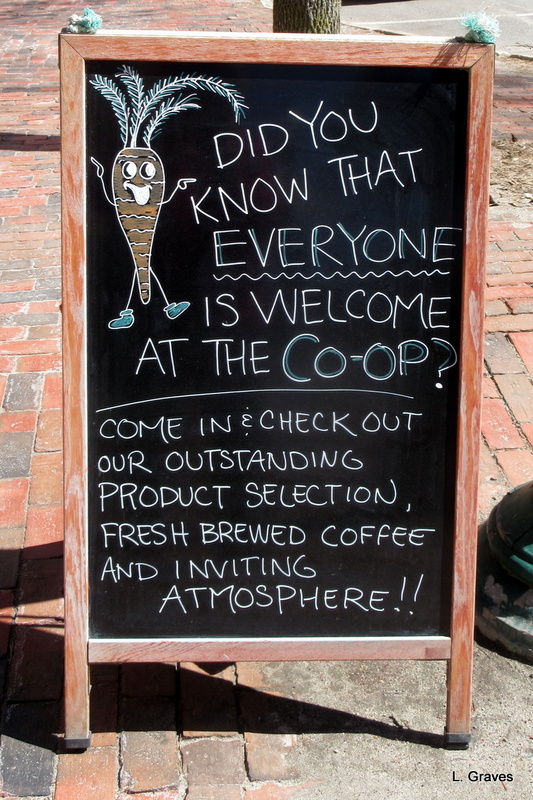 I love to shop in places like your Co-Op! Gardiner sounds like a good place to live and looks very attractive. It is a great place to shop. Glad we live close enough to go on a regular basis.